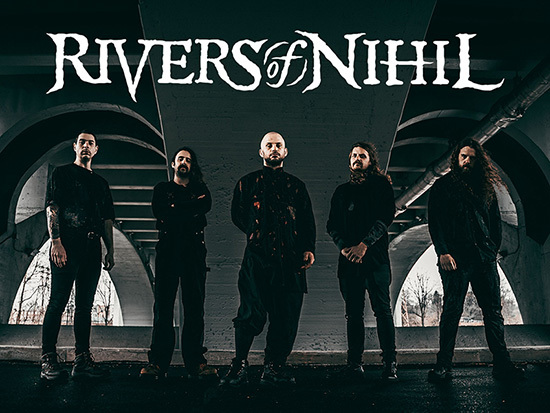 The members of RIVERS OF NIHIL honed their chops as high schoolers in various bands in the Reading scene, eventually coming together to form RIVERS OF NIHIL in 2009. They recorded their first EP Hierarchy that year with Carson Slovak (Century), regularly toured the Northeast and Midwest, and scored local opening gigs for the likes of Decapitated, Decrepit Birth, Suffocation, Dying Fetus, and Misery Index. Two years later they regrouped with producer Len Carmichael to record their next EP Temporality Unbound, which saw the band earn recognition in the national metal scene as well as start to attract the attention of record labels and eventually saw the band signing with Metal Blade Records in late 2012.